Vishal Gondal, who had resigned from his post as the managing director of the digital arm of Disney UTV in April last year has launched his new venture. Gondal, who is the founder and CEO of Indiagames, the country's largest digital gaming firm (which was acquired by UTV and is now part of Walt Disney), had decided to leave the company to pursue entrepreneurship. The new venture, called GOQii basically offers a combination of advanced wearable technology, expert-led personalised coaching and elements of social philanthropy (karma) to enable its users to make a permanent shift to a healthier and more fulfilling lifestyle. For the same, it focuses on sustained engagement and goal reinforcement, and offers a complete ecosystem as a single integrated solution, which is a combination of technology and human connection. "The GOQii philosophy is driven by the passion for healthy and meaningful living. Having used many other wearable tech products, I felt that something was missing - they were just a bunch of gadgets, apps and online data-crunching solutions, which lacked sustained engagement, motivation, customised advice or a human connection. I needed something more than data; I was looking for a complete solution for a more fulfilling way of life," said Gondal. According to him, the differentiating factor for GOQii lies in the fact that while existing apps, wearable gadgets and online solutions only provide simple data collection tools or diet logging apps, leading to short-term results, the company integrates the 'human factor' via a GOQii personal coach, who works with the user's data to provide customised advice on a regular basis, to keep the user motivated and on track to success by goal reinforcement. GOQii Band: An advanced fitness tracker that has a number of features, including a full touch display, a vibrating alarm, ultra-lightweight water resistant construction with skin sensitive materials, and automatic wireless syncing via Bluetooth LE. Its key functions include a watch, a motion sensor that can track steps, calories, distance, active time as well as 'Karma Points', which is basically a virtual currency for philanthropy. 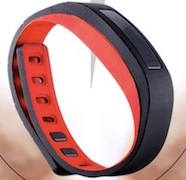 The human connection is also provided in the band since it enables the user's GOQii coach to remotely vibrate the band to motivate the user. GOQii Experts: An array of health, fitness and habit experts responsible for designing GOQii Life. They also help users in making sense of their data along with training the coaches on the methodology and techniques related to motivation, nutrition, fitness and habit development. GOQii Coach: Consists of leaders from the fields of fitness, sports, nutrition and behavioural science, who are trained to apply scientific methods to enable users to make sustainable and incremental changes towards a more healthy and active lifestyle. Users are seamlessly connected to their personal GOQii coach via an app and pre-scheduled monthly video/audio calls. This system is minimally intrusive, while simultaneously giving users flexibility for on-demand access as well as regular communication with their coach. GOQii Karma: The platform also enables its users to support social causes of their preference. A user's steps are used as 'sweat' equity by converting their effort into Karma points, which are then used to make donations towards their social causes of interest. At the backend, GOQii has developed a network of donors and recipient non-profit organisations to convert Karma points donated by its users to actual monetary donations. For the same, GOQii is partnering with Oxfam India, a member of an international confederation of 17 organisations working in more than 90 countries to find solutions to poverty and injustice around the world. 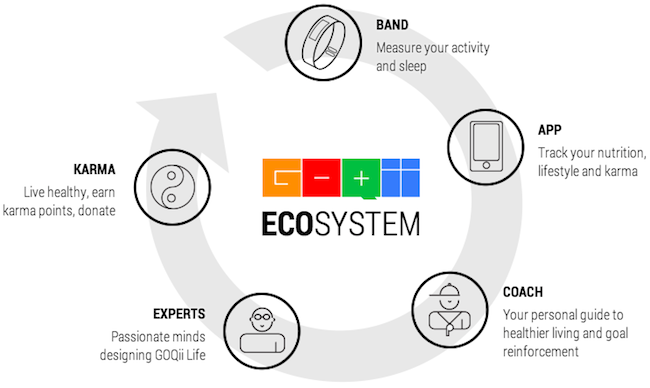 As of now, the company is offering subscription for GOQii, which includes all elements of its ecosystem (including band, experts, coach and karma) for 6 and 12 months. Released in beta in India for a few early users, the plans are available for a price of Rs 5,999 and Rs 9,999 for the half-yearly and yearly packages, with deliveries starting as soon as April 2014. Going forward, the company also plans to roll out its product in countries like the US, the UK, UAE and Singapore. In terms of competition, a number of companies offer similar fitness products that include Nike+ FuelBand, Fitbit Flex, and Jawbone Up. However, the human connection being offered by GOQii could end up working in favour of the company, since many users of similar products complain of losing interest in the devices over time. Headquartered in California (US), the company also has offices in Mumbai (India) and Shenzhen (China). It is backed by a number of angel investors, including Amit Singhal (Google), Anil Godhwani (Habitera), Bharat Vasan (MyBasis), Esther Dyson, Goutam Godhwani (Simply Hired), Kanwaljit Bombra (Dell), Mahesh Samat (Epic), Mike McNamara (Flextronics), Prashant Gulati (TiE), Sanjay Parthasarthy (Indix), Sanjay Vaswani, Steve Luczo (Segate), Taher Khorakiwala and Vijay Vashee (Microsoft). Karisma Kapoor invested in BabyOye.com, a baby products site; Sanjay Dutt and Ajay Devgan invested in Ticketplease, an online ticketing site; Shilpa Shetty invested in GroupHomeBuyers.com, a home-buying site; Vatsal Seth invested in Celebwears.com, an online store that sells customised wardrobes and celebrity clothes; Neha Dhupia actually launched her own e-commerce site called HerStyle.in that sells women's apparel, fragrances and personal care products, etc. Bollywood actor Salman Khan also invested an undisclosed amount in Gurgaon-based online travel company Yatra.com picking up a little less than 5 per cent stake in the company. The Indian venture of the UAE based premium-experience travel portal Musafir.com is also promoted by Viva Holdings, retired Indian cricketer Sachin Tendulkar and Universal Travels and Tourism LLC (UAE). Tendulkar, who is also the brand ambassador of the company, holds a minority 7.5 per cent stake in the company through a global endorsement deal.